On my recent vacation, I drove to my family's summer cottage, and along the way, I was scanning through the radio stations and was startled to hear Casey Kasem's voice doing the American Top 40 syndicated radio program from the same week, only it was the broadcast from 30 years earlier! That's right, they were rebroadcasting old recordings of the original countdowns from the 1970s. I was a bit freaked out at first, but if I could avoid listening to yet another broadcast of of Rihanna's über-repetitive (and vapid) lyrics, I was content. 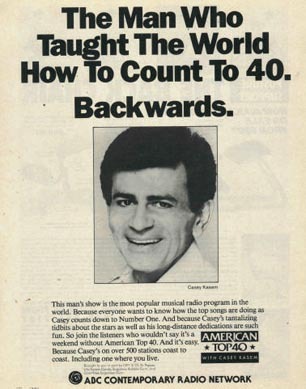 I discovered that a number (reportedly 200+) of radio stations across the U.S. are now regularly rebroadcasting old Casey Kasem countdowns of "America's Top 40" (AT40) from both the 1970s and the 1980s, so I decided to investigate further. I knew that on the week of July 4, 2009, after 39 years on air, Casey Kasem ended his run on the radio (a guy's gotta retire someday!). He was the voice of that radio program from July 4, 1970 to 1988, and again from March 1998 until January 10, 2004, when Ryan Seacrest officially succeeded him in that role. Urgh ... I'm still unforgiving of the fact that Ryan Seacrest tried to push the untalented, un-entertaining Kardashian clan upon us (I've watched the show only once out of curiosity, which was more than enough!). I learned, however, that the American Top 40 show's producer, Premiere Radio Networks, informed its affiliates that they would stop producing any new American Top 10 and American Top 20 countdown shows as of the July 4th  weekend, so it looks like Ryan's lost one paying gig, although he's been busy reporting for NBC on the 2012 Summer Olympics, so I don't think he's hurting very much. Still, I was intrigued by the idea of retro radio for such a well-known radio personality (Casey Kasem), so I investigated further. Casey Kasem was a staple on the airwaves for many years, and he was known for being a longtime Los Angeles-area DJ who also happened to be a big music historian, which was one reason his show endured with such high ratings for such a long time. Ryan Seacrast was no music historian and farmed all that work out to others, hence he wasn't able to keep that going for nearly as long as Mr. Kasem did (Mr. Seacrest did it for less than 8 years). Anyway, in my venture for more info. on rebroadcasts of old AT40 broadcasts, I discovered that in August 2006, XM Satellite Radio (now merged with Sirius Satellite Radio) began airing newly-restored versions of the original "American Top 40" radio show from the 1970s and 1980s. From there, Premiere Radio Networks also started airing reruns of the restored AT40 (dating from 1970 to 1978 and 1980–1988) recordings in January 2007 on local stations nationwide. Those are full 3-hour or 4-hour length classic AT40 shows from 1970-1979, all in their original broadcast form, although officially, Premiere Radio Networks only permits them to be broadcast between 6:00 am - 12:00 am Local Time on weekends so as not to conflict with what the Satellite networks might be doing. Some further investigation on my part (via Facebook) revealed that there are some questionable sites selling archived the restored MP3s for the old AT40 broadcasts. For anything other than Mr. Kasem himself or Premier Radio Networks or their affiliated TuneIn.com sites, I would not recommend using them. However, thanks to the Internet and TuneIn.com, you can listen to old AT40 broadcasts online ... legitimately. What's more, the Internet can also help you find any local broadcasts for the shows that may exist near you. They broadcast old AT40 shows from both the 1970s and 1980s, so I'm listing both decades below to make it easy to find. I've already noted that Ryan Seacrest's version of AT40 has been terminated, but while I'd like to blame Mr. Seacrest, I suspect the real reason may be due to technology. Today, thanks to the Internet, people really don't have to wait until the end of the week to learn what the top hits are. Just search iTunes, Spotify or Google, and voilà, you have it instantly. Mr. Seacrest may not be able to fix that. We live in a society with very short attention spans, so it may be best that AT40 is now sailing into the sunset. As for listening to re-broadcasts of the old show, aside from the originals, those are history (at least for the time being) right now. But some companies have been working to make sure the old broadcasts don't become footnotes of history. Author P.S., Jun 15, 2014: During the past several weeks, there was news that Casey Kasem's children had won the legal right to see their biological father. They were estranged from their father and his spouse, but the children had legal concerns over the care their father was receiving during his final days. 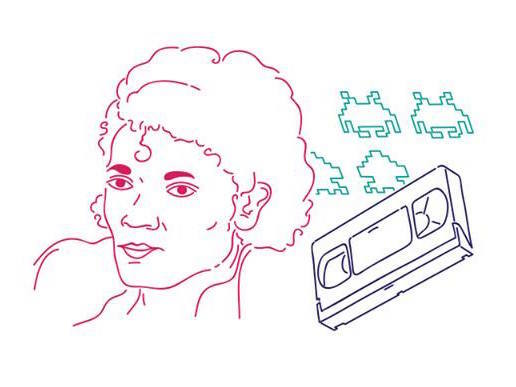 The man was known for his love pop music and its history had turned a seemingly ordinary job of DJ into an $80 million empire in the 1970s and 1980s, which was a tidy sum for a seemingly ordinary job. On Sunday, June 15, 2014, Casey Kasem passed away. Thanks for the info! I'm definitely going to try and catch some of the 70s shows. Kasem was also the voice of Shaggy on Scooby-Doo. I wonder which voice was closer to his "real" voice - radio host guy or frightened beatnik? AT 40 (both the CHR and AC versions) are still produced each week by Premiere and heard nationally. Seacrest only shows up once a week to voice track the show minus the songs in little more than 30 minutes time.